Here are four varied works for small orchestra by Italian composers. They cover quite a diverse span of styles in performances that are alert and caring. 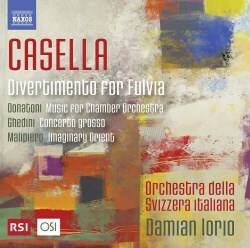 Casella's light-hearted gifts are at work in his ten-movement war-time Divertimento per Fulvia. The score is the very antithesis of long-winded and has a neo-classical patina that brings life and youthful fluty energy. Touched with Stravinsky's Pulcinella Casella stays true to himself by drizzling feather-touch charm into the mix alongside some sweetly tuned Ravel-like shadows. By the way, Fulvia was Fulvia Casella, Alfredos daughter. Donatoni's Musica is a longer piece and takes full advantage of the new discordant episodic angularity of the times. His sound is chill yet often tender. He allows plenty of air around what is going on in what is a busy score. It's a stern contrast with the Casella; after all Donatoni was only twenty when Casella died. The composer's favourite teacher was, it seems, one of Casellas former protigis, Goffredo Petrassi. Ghedini's Concerto grosso for wind quintet and strings is the second oldest piece here. It fuses an evident affection for Beethoven with something of the neo-Tudor sense that you encounter in Arnold Rosner and in Warlock's Capriol. The work is in five supple movements. David Gallagher's excellent notes for the disc tell us that Ghedini wrote the introduction to the Beethoven entry published in 1963 in the Italian Enciclopedia della musica. Naxos state that these are world premiere recordings, except the Casella. The days when Casella's name was kept alive in the catalogues only by his Violin Concerto - Gertler on Supraphon - are now well and truly behind us. That Supraphon disc included the Violin Concerto of Gian Francesco Malipiero, a composer who was an especially active agent in the musical life of Italian music during the period prior to 1920. Malipiero has been extensively recorded on Naxos so we have a pretty rounded picture. His Oriente immaginario is quite different from the other works here and is also the shortest. Across its three movements it is replete in late-romantic impressionistic oriental gestures. The orchestration is lush and fits well with similarly exotic scores by Schmitt, Pizzetti and Respighi. The engineering has been adroitly handled.